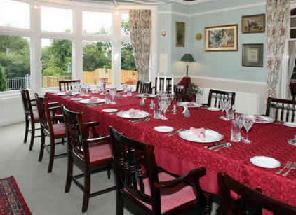 Rayanne House offers exclusive private dining for a minimum of 10 people and a maximum of 36. A whole range of events are suited to this perfect venue; from celebratory occasions such as small wedding receptions, anniversary dinners and birthday bashes, to discreet company meetings, seminars and other corporate events. Have you got Google Earth on your computer? If so, then download the Google Earth Map of Rayanne House. Is this the wrong position for Rayanne House? If you think so, then modify its position. What i can i say, it was one of the best places i have ever stayed. The rooms are magnificent. The breakfast was out of this world and the service was second to none. Well done the Rayanne. I will be back. This is one of the best kept secrets in Ulster. The dining room is beautiful and oppulent, the service a perfect balance not too intrusive but very attentive you will look for nothing and the Food...Oh My ...honestly I am a big foodie and this was by far the best meal I have had in NI. I wish you could book for just 2 but it has to be for 10 or more people. Fabulous food and location.